Finmeccanica-AgustaWestland has announced that Sino-US Intercontinental signed a contract for three AW119Kx single engine helicopters, further expanding the presence of AgustaWestland helicopters in the Chinese civil market. The three helicopters are expected to be delivered within 2015. Sino-US Intercontinental acts as an official non-exclusive distributor for AgustaWestland civil helicopters in China, excluding Hong Kong and Macau, and has placed orders for a total of thirty helicopters since late 2013 comprising AW119Kx single engine, GrandNew light twin, AW169 light intermediate, AW139 intermediate and AW189 super medium helicopters. The partnership has further expanded the presence of the AW119, GrandNew and AW139 models and introduced the whole Family of new generation types also including the AW169 and AW189 into China. AgustaWestland and Sino-US are devoting significant efforts to strengthen the level of service in China with comprehensive maintenance and training solutions to further enhance operational effectiveness and safety and maximize customers’ advantage in using AgustaWestland’s state-of-the-art products in the country. This contract marks a further major result for AgustaWestland in China following the ‘Best Civil Helicopter Award 2015’ won during the China Civil Helicopter Summit in Beijing at the end of June. The award recognized the high quality standard, mission capabilities, latest technology, safety and cost-effectiveness of the range of AgustaWestland civil helicopters in service today with Chinese customers. The important contribution by AW119, AW109 Power, AW109 Grand, AW109 GrandNew and AW139 helicopters in performing Public Services in China was also acknowledged through the ‘Best Community Service Award’ won by Beijing Public Security Bureau’s Police Aviation Team, which operates three AW109 Power and two AW139 helicopters. The ‘Best Civil Helicopter Award’ provided further evidence of the outstanding success achieved by AgustaWestland’s range of civil products in China, which benefits from the most recent certification and technology standards, an in-country presence through the Shanghai-based AgustaWestland Regional Business Headquarters aimed at embracing growing Chinese customers and AgustaWestland’s commitment to delivering the best level of customer service. 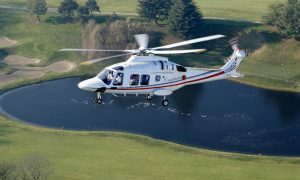 More than 130 AgustaWestland helicopters have been sold to Chinese customers to date. The AW119Kx is the latest evolution of the proven AW119 single engine helicopter which features the Garmin G1000HTM integrated flight deck system while keeping the AW119’s outstanding performance, cabin space, payload as well as critical systems redundancy. The new avionics system includes a synthetic vision system, moving map, highway in the sky and obstacle/terrain avoidance systems for enhanced situational awareness and safety. The latest variant of the AW119 has already found significant success among customers in the Americas and Australasia for a range of applications. Almost 250 AW119 helicopters have been ordered to date in more than 30 countries by over 110 customers. The new AW119Kx is perfectly suited to perform many roles including executive/private transport, EMS, utility, fire-fighting, law enforcement and other duties.